The Queyras is located in the department of the high Alps, along the Italian border. Besides being a valley through which the Guil, Queyras is also a Regional Natural Park, which boasts no fewer than 11 municipalities: Abries, Aiguilles, Arvieux, Ceillac, Castle-Old Town, Molines, Ristolas, Saint Veran and partially municipalities Eygliers, Guillestre and Vars. 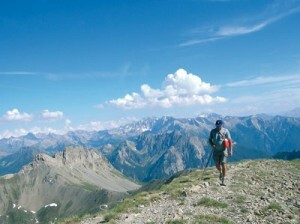 With over 100 km of marked trails and 200 km of groomed trails, Queyras is the 3° field of France. Summer or winter, the Queyras still attracts many tourists eager to discover the natural park. By taking the GR5 that connects Briançon to Nice, or the GR58, you can browse the different villages and valleys of Queyras. During your walks and hikes, perhaps you will have the chance to cross on your passage of roe deer, chamois, marmots, golden eagles, dippers, or even the famous grand Duke of Europe, the largest owl. If you love snowshoeing or cross country skiing, holiday in the Queyras is necessary. No doubt you will love this amazing area! ← Hawaii, a surfer’s paradise!